We can make 200 tons of bands in an hour; the profit for each ton is 25 dollars; the demand is 6000 tons. We must make at least 1000 tons of this product. We can make 140 tons of coils in an hour; the profit for each ton is 30 dollars; the demand is 4000 tons. We must make at least 2000 tons of this product. We have 40 hours of production time available. The goal is to design a production plan to maximize total profit. If you have added the AMPL installation directory to the search path, you can run AMPL from any directory. Otherwise, run AMPL by moving to the AMPL directory and typing ampl at the shell prompt. At the ampl: prompt, you can type any AMPL language statement, or any of the commands described in Section A.13 of the book AMPL: A Modeling Language for Mathematical Programming. To end the session, type quit; at the ampl: prompt. Generally, you will edit your model and data (both expressed using AMPL language statements) in a text editor, and type commands at the ampl: prompt to load your model and data, solve a problem, and inspect the results. Although you could type in the statements of a model at the ampl: prompt, AMPL does not include a built-in text editor, so you cannot use AMPL commands to edit the statements you have previously entered. Microsoft Windows users (on PCs) and XWindows users (on Unix systems) should open separate windows for editing files and running AMPL. You can use any text editors to edit your model and data files. Use editor menus and commands to edit your file, then save it and exit the editor. Note that editing a file in a text editor does not affect your AMPL session until you explicitly reload the edited file, as shown above. Note that this assumes that steel.run is in the same directory as the model and data files, and that AMPL can be found on the path. AMPL’s solver interface supports linear, nonlinear, and mixed integer models with no built-in size limitations. This interface is rich enough to support many of the features used by advanced solvers to improve performance and solution accuracy, such as piecewise-linear constructs, representation of network problems, and automatic differentiation of nonlinear functions. To take advantage of these features, solvers must be written to utilize AMPL’s interface. Most solvers have algorithmic options, such as CPLEX with its Mixed Integer and Barrier options. 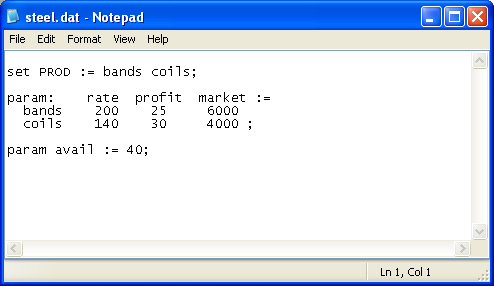 In these cases, you give the solver executable name to AMPL (for example, with option solver cplexamp); the solver will determine, from the problem characteristics as passed by AMPL (for example, a quadratic objective or integer variables) as well as solver options you specify, which algorithmic options will be used. You can specify option settings for a particular solver through the AMPL option command. (CPLEX-specific directives are described later in this document.) Since all solvers provide default settings for their options, this is necessary only when your problem requires certain nondefault settings in order to solve, or when certain settings yield improved performance or solution accuracy. Solver options consist of an identifier alone, or an identifier followed by an = sign and a value. Some solvers treat uppercase and lowercase versions of an option identifier as equivalent, while others are sensitive to case, so that RELAX is not the same as relax, for example. If you use the latter approach, be sure to include spaces at the beginning or end of the individual strings, so that the identifiers will be separated by spaces when all of the strings are concatenated. When you type solve; AMPL processes your model and data to create a temporary problem file, such as steel.nl, which will be read by the solver. 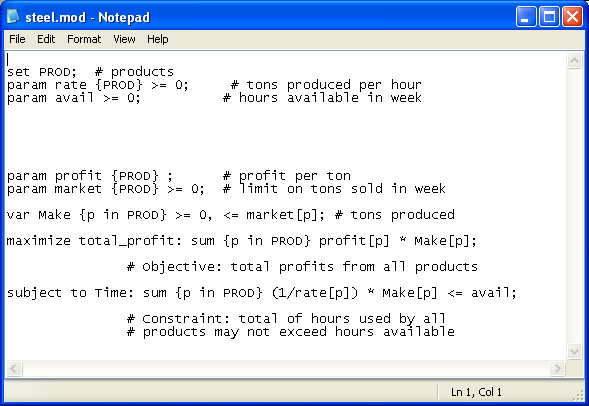 It then loads and executes the solver program, which is responsible for creating a solution file such as steel.sol. AMPL reads the solution file and makes the solution values available through the variable, constraint, and objective names you have declared in your AMPL model. Unless you specify otherwise, AMPL then deletes the temporary problem and solution files. Note that when you simply mention the name of a constraint in a display statement, AMPL will display the dual value (shadow price) of that constraint, not its left-hand side value. You can use the AMPL suffix notation to display the left-hand side value, as described in the book AMPL: A Modeling Language for Mathematical Programming.